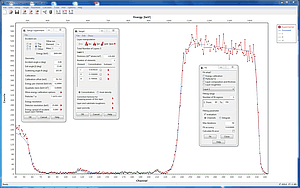 SIMNRA is a Microsoft Windows program for the simulation of charged particle energy spectra and gamma-ray yields for ion beam analysis with incident ions from about 100 keV to many MeV. SIMNRA can be used for the simulation of Rutherford backscattering spectrometry (RBS), elastic backscattering spectrometry with non-Rutherford cross-sections (EBS), nuclear reaction analysis (NRA), elastic recoil detection analysis (ERDA), medium energy ion scattering (MEIS), and particle induced gamma-ray emission (PIGE). Almost 3000 different non-Rutherford, nuclear reactions and PIGE cross-sections for incident protons, deuterons, 3He, 4He and Li-ions are included. SIMNRA can calculate any ion-target combination including incident heavy ions and any geometry including transmission geometry. Arbitrary foils in front of the detector and arbitrary beam windows are possible. 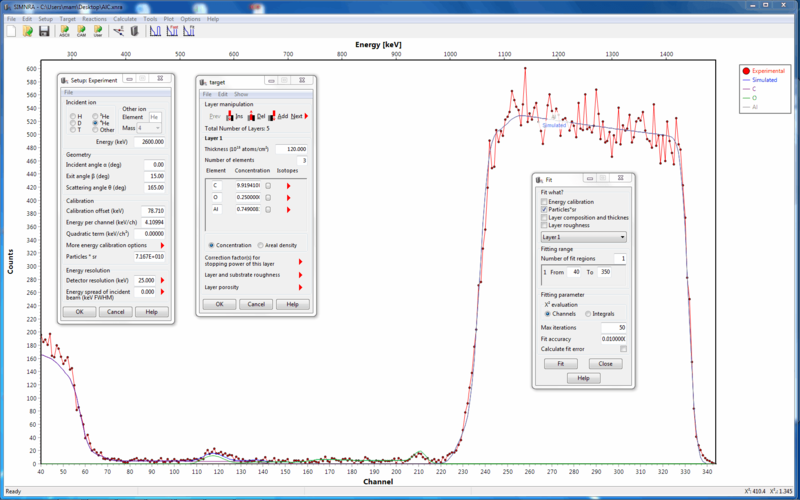 SIMNRA graphical user interface, showing an experimental spectrum (red), a simulated spectrum (blue), spectra of individual elements (magenta, green and grey); and forms for defining experimental setup, target composition, and fit parameters. The cross-section calculator SigmaCalc by A. Gurbich allows calculating cross-section data for non-Rutherford backscattering and nuclear reactions for many ion-target combinations at any angle: This allows unsurpassed accuracy for the simulation of a large number of elastic backscattering and nuclear reaction analysis measurements. The capabilities of the program are fully described in the SIMNRA User's Guide (352 pages, PDF, 4648 KB). SIMNRA is not free. It is a shareware program, which can be used for a trial period of 30 days without fee. If you want to use SIMNRA after this period, you have to register. See Registration / Pricing for registration and pricing details. SIMNRA is used at more than 220 laboratories world wide and referenced in more than 1400 publications (July 2017). It is the most popular program for the evaluation of ion beam analysis data since 2007, see Citations. SIMNRA was developed by Matej Mayer at the Max-Planck-Institut für Plasmaphysik, Garching, Germany. More information about the author. MultiSIMNRA: This code was developed by Cleber Rodrigues and Tiago Silva from the University of São Paulo, Brazil. It allows self-consistent analysis and fitting of multiple IBA spectra. It can be downloaded freely from the MultiSIMNRA web site. SIMTarget: This code was developed by Julien Colaux from the University of Namur, Belgium. It allows a quick generation of the target file used by SIMNRA regardless of the sample complexity. It can be downloaded freely from the SIMTarget website.